In this section we take a look at the various surface craft used by the Special Boat Service (SBS). For info on SBS submersibles, click here. In this age of high-tech warfare, it may seem strange that the SBS are still using canoes, equipment that hasn't essentially changed much since World War 2 but the reality is that these non-metallic canoes still provide an effective, stealthy method of moving small teams of men around enemy coastlines and waterways. A pair of Royal Marine Reservists paddle a Klepper Canoe. The Klepper canoes can be broken down into 2 parts so that the 2 man crew can carry them on their backs across terrain to either another launching point ot cacheing spot. A GPMG or mortar(!) can be fitted and crew members may carry anti-tank rockets to deal with enemy surface craft. The Kleppers are also versatile in the way they can be deployed. They can be launched from mother ships, surfaced submarines or even carried to the surface by divers leaving a submerged sub. Kleppers can be parachuted from C-130s into the ocean or dropped out the back of helicopters. 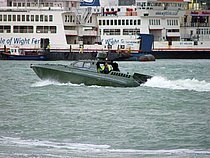 Rigid Inflatable Boats (RIB) are lightweight and fast powerboats operated by Special Forces Boat Operations (SFBO). The SBS are transported in a number of boats that may be categorised as long range interceptor/insertion craft (LRIC). These are typically large and fast with powerful engines. Some have stealth capabilities. This is a Fast Interceptor Craft (FIC) with stealth characteristics that serves as a long range insertion and interception vessel. The FB MIL-50P is produced by the Italian company, Fabio Buzzi Design. 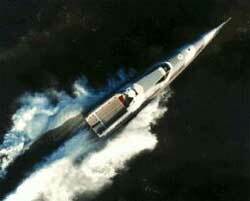 It is believed the SBS operate a small number of these boats in an interception / insertion role. The FB Mil-50P features Trimax Surface Drive props, a 2-speed gearbox and is powered 3 x 1000hp Seatek engines, giving the boat a top speed of 70 knots. The design features an enclosed cabin and a number of saddle-seats for 8 or so SBS passengers. A flatbed area at the stern may be used to launch and recover smaller craft such as inflatables, canoes or diver propulsion devices. Photos of the craft indicate a sensors fitment, likely a radar dome, mounted atop the cabin. An encrypted communications fitment is also highly likely. These boats are likely to be crewed by specially-trained Royal Marines coxwains (Special Forces Boat Operators (SFBO)). The SBS has reportedly been using the VSV since 1999. The VSV (Very Slender Vessel) is designed to pierce the waves rather than ride over them, giving them greater range and speed and making for a smoother ride. Wave piercing boats can also operate in rougher seas than boats with traditional hulls. Such craft give the SBS long range insertion capability as well as the ability to chase down drug runners. SBS VSVs can be fitted with twin .50 caliber machine guns. VSVs are fitted with sophisticated navigation and communication equipment. It is believed that the SBS use the VT Halmatic VSV 16. This VSV is 16 meters long and just over 3 meters wide and is powered by 2x750hp engines. The exact composition of the VSV 16 is classified although it is thought to include carbon fibre and kevlar. The angled design of the VSV16 also gives the boats a low radar profile and reduced wake production. This design, combined with radar-absorbent materials and paint, make the boat highly stealthy - perfect for the SBS. Also classified is the VSV 16's exact top speed. This is reported to be in excess of 60 knots. Certain SBS boats, such as RIBs, can be parachuted into action via C-130J Hercules on 'boat drop' operations.